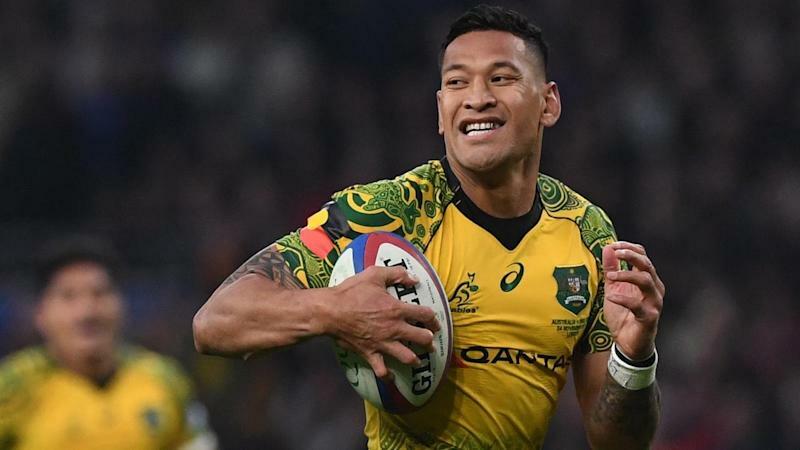 Wallabies superstar Israel Folau has two days to respond or face the sack after being served with a breach notice by Rugby Australia over his controversial social media posts. RA CEO Raelene Castle said the RA integrity unit had deemed Folau had committed a "high level" breach of the players' code of conduct which warranted termination of his contract. "Israel has 48 hours to accept the sanction or have the matter sent to a code of conduct hearing,' Castle said. Folau remains stood down by RA over his religiously-motivated posts last week proclaiming hell awaits "drunks, homosexuals, adulterers, liars, fornicators, thieves, atheists and idolaters". Asked if Folau was being punished for his religious beliefs, Castle said "this is not a religious discussion, this is a discussion around the employee-employer relationship." Castle said Folau had been unapologetic about the posts and his stance when she met with him last Friday. "That left us with no option but to move forward to the position that we've taken," Castle said. He had been warned, formally and repeatedly about social media expectations after he made similar posts about a year ago. "It was made clear to Israel in writing and verbally when I met with him last year that any social media posts or commentary that in any way were disrespectful to people because of their sexuality would result in disciplinary action," Castle said. "Despite this Israel has chosen to ignore this warning." Castle said there had been no additional clauses about social media use inserted in Folau's latest contract. "It's very disappointing from my perspective because I had a very direct and specific conversation with himabout the expectations that I had," Castle said. "He accepted that conversation, he said that he understood that conversation, he shook my hand at the end of that and said he was very clear, and yet he has gone off and done this." Earlier on Monday, Wallabies coach Michael Cheika told reporters that Folau's "disrespectful" comments would make it impossible to pick him in the national team, which is preparing for this year's World Cup in Japan. Asked if he would be comfortable taking the field again alongside Folau, Wallabies and NSW Waratahs captain flanker Hooper said: "In this current state and being here and talking about this as a rugby player, it makes it hard, it makes it difficult. "You take your friends warts and all, and your teammates," Hooper added. Cheika said he didn't think the issue would rear its head again after the controversy of last year's tweets and Rugby Australia's subsequent talks with Folau. Folau told reporters after attending his church on Sunday that he stood by his posts and was prepared to walk away from the game for the sake of his faith. Waratahs CEO Andrew Hore said the his players, one of who is Folau's brother John, had been briefed on Monday.